Flagstaff—or Flag, as the locals call it—offers an ideal, scenic environment for living and learning. With a four-season climate and dynamic landscapes, you’ll discover outdoor adventures unlike anywhere else in Arizona. Travel + Leisure magazine named Flagstaff among the top 10 Best College Towns in America. Time.com called it one of the nation’s happiest cities. Outside Magazine ranked Flagstaff as the 7th best town in the nation. Fodor.com named the city one of “20 College Towns We Love to Visit,” citing Flagstaff’s nearly 700 acres of park land and 50 miles of trails. 1. Arizona Snowbowl—Snowboard or ski at Northern Arizona’s ski resort, just 15 miles from downtown. 2. Oak Creek Canyon—Sunbathe on Sedona’s red rocks and swim in the creek, less than an hour’s drive to the south. 3. 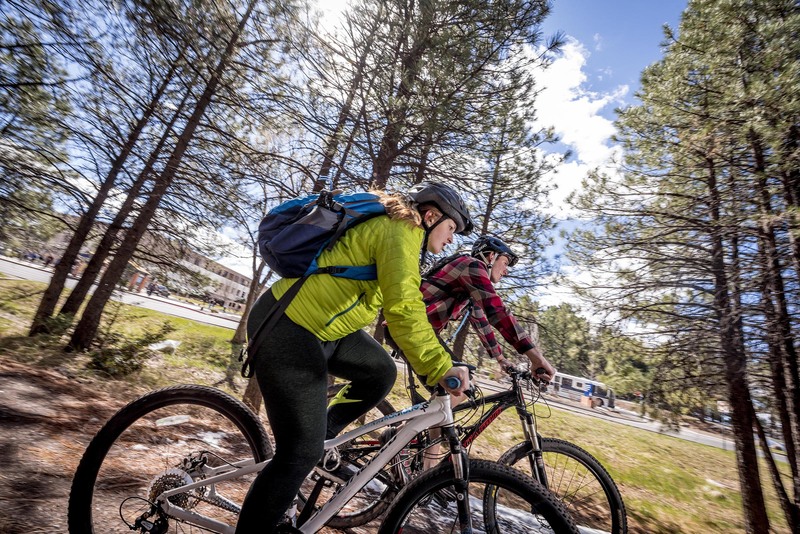 Flagstaff Urban Trail System—Enjoy 50 miles of hiking and mountain biking trails and running tracks. 4. First Friday Art Walk— Celebrate art and local businesses in bustling downtown Flagstaff each month. 5. Lowell Observatory—Explore the galaxy at one of the premier deep-space research sites in the world. In fact, Pluto was discovered right here in the world’s first Dark Sky City. 6. Heritage Square—Attend events like Movies on the Square, art fairs, and concerts in Flagstaff’s historic town square.